The Ontario Government has created the Healthy Kids Community Challenge to motivate communities to engage their youth in active healthy lifestyles. The Healthy Kids Community Challenge is happening in 45 communities across the province. Niagara is one of those communities and Niagara Falls, along with the other 11 Niagara Region municipalities, is participating. Healthy Kids Community Challenge will introduce a new theme approximately every 9 months that relates to healthy eating or physical activity. The first theme is Run. Jump. Play. Every day. The City of Niagara Falls, along with its partners from the District School Board of Niagara, Niagara Catholic District School Board, YMCA of Niagara, and various private businesses, has created the Niagara Falls Activity Passport for Theme 1. In an attempt to reach all Niagara Falls students in grades 1 through 6, the passport is being distributed to youth through the school boards. Youth and their families can take advantage of various free activities offered within the Passport from May 1 to June 11, 2016. Activities include skating at the Gale Centre, swimming and Youth Action sessions at the MacBain Community Centre through the YMCA of Niagara. The Passport also includes other fun exercises along various Niagara Falls trails and parks. By participating, youth are eligible to win incentive active prizes, with over 100 available. The Passport is easy, fun and free to PLAY! Participating schools have delivered the Passport to children in grades 1 through 6, encouraging them to take it home so parents and guardians can learn about up-coming free active opportunities that they can take advantage of as a family or by themselves. There is no registration or fee to participate. Simply detach the Passport from the schedule card, record findings that were discovered along our trails and parks or have facility staff initial the Passport to confirm attendance at either the open skate, swim or Youth Action event. Youth must complete at least eight action items and the questionnaire inside the Passport to be eligible for any draw prizes. Completed passports can be submitted for draw prizes at either the MacBain Community Centre or the Gale Centre, during operating business hours. Passport submissions must be submitted prior to 4:00 pm on Monday, June 13, 2016, to be eligible for the draw. 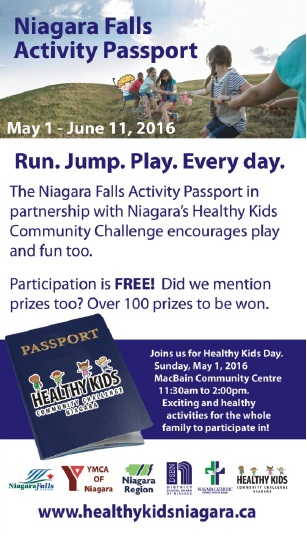 For complete Passport details, please visit www.healthykidsniagara.ca or call the City of Niagara Falls, Recreation & Culture at 905-356-7521 extension 3330, Monday to Friday, 8:30am to 4:30pm.